Wood sheds need only a floor and a roof to keep firewood out of the elements and conveniently stored for use in camping or for the winter. However, the specific design will depend on your home environment. There are many sources for wooden firewood shed designs in books, magazines and websites. Choose a firewood shed design large enough to fit your needs. The source of the most detailed plans for wooden firewood storage sheds is books or magazines with chapters or titles on the topic. If you aren't already familiar with building construction, these sources provide vital insight into proper planning, foundation and building for utility and longevity. Two such books are "Sheds, Gazebos & Outbuildings: 8 projects with plans & instructions" and "Black & Decker The Complete Guide to Contemporary Sheds: Complete Plans for 12 Sheds, Including Garden Outbuilding, Storage Lean-to, Playhouse, Woodland Cottage, Hobby Studio, Lawn Tractor Barn." Designs for firewood storage sheds are often available online from woodworking websites or do-it-yourself sites. These designs, however, do not always contain step-by-step instructions. If you're already comfortable with woodworking and constructing small buildings, these sites can provide inspiration, or can serve as a source for additional ideas for more detailed firewood storage shed plans from books or magazines. 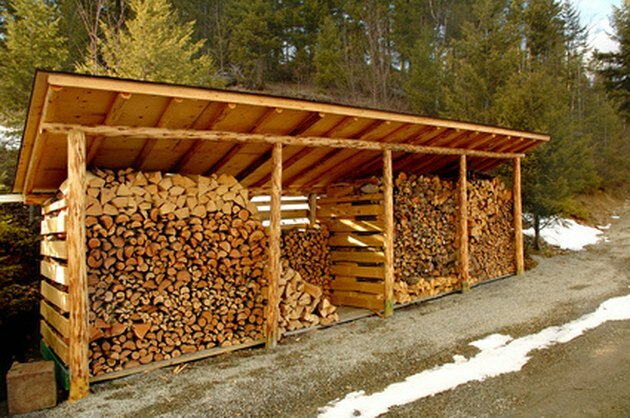 All firewood storage sheds have a floor to protect the bottom stack of wood from moisture and decomposing elements, and a roof to keep precipitation off the wood while it cures. However, most do not have walls, or have only one or two walls. These designs allow airflow around the wood so that it can dry and cure quickly. Lean-to firewood shed designs are not advisable in areas where fire safety is a concern. Your firewood shed is essentially fire fuel storage, and not the ideal thing to have resting against a wall of your home. Free-standing firewood storage sheds keep the fuel separate from your house, helping to prevent or reduce fire damage to the home in case of a fire accident. A free-standing design also keeps termites attracted to the curing wood farther from your home.